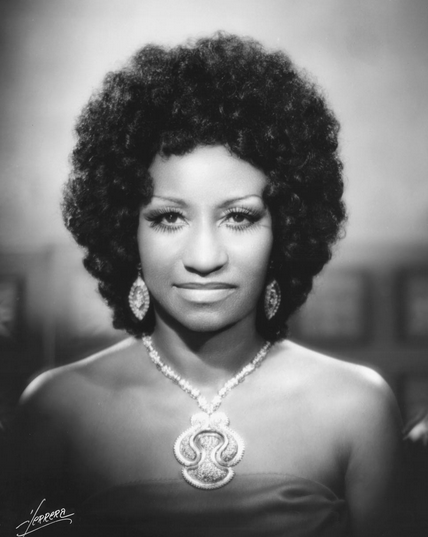 1925?-2003 Celia Cruz rose from her musical career in Latin America to become the leading female Afro-Cuban and Salsa vocalist in the United States, becoming a symbol of the spirit of the Cuban expatriate community. Cruz was born Ursula Hilaria Celia de la Caridad Cruz Alfonso in the Santos Suarez district of Havana, Cuba, probably in 1924 or 1925. As the second oldest child in an extended family that included as many as 14 children, she often helped her mother, Catalina, with household tasks while her father Simon was off working on railroad trains. Havana’s cultural ferment provided Cruz with exposure to many singers and even the music of the African-Santeria religious tradition. She and a cousin showed enough early talent that her mother took them to sing in local cabarets, where she won small prizes in various competitions. In deference to her father’s wishes, Cruz enrolled in the Normal School in Havana for teacher training. When one of her teachers told her that an entertainer could earn more than a teacher’s monthly salary in just one day, however, she made a commitment to music. Her professional breakthrough came in 1950, when the lead singer of a well-known Cuban band, Sonora Matancera, resigned and Cruz was asked to step in. Despite the initial public resistance to the change, she and the band persisted, playing a mix of guaracha, cha-cha, and bolero musical styles, and Cruz quickly won over audiences throughout Cuba. Cruz and the band, which became known as Café Con Leche (“coffee with milk”), performed together for 15 years, during which time she developed her trademark call-out “Azucar!” (“sugar!”), based on the punch line to a favorite story of hers. Their tours, as well as Cruz’ fame, extended to much of Latin America, and included radio, television, and film appearances. With the coming of the Cuban revolution in 1959 and a decline in Havana’s cultural scene, the band began spending more time outside the country. Upon Fidel Castro’s rise to power in 1960, they defected en masse to the United States where Cruz would become a naturalized citizen. Castro was so incensed by Cruz’ betrayal that he vowed never to allow the singer back into Cuba. During this period, Cruz became romantically involved with the band’s lead trumpet player, Pedro Knight, whom she married in 1962. Knight would also become Cruz’ manager and music director when she subsequently developed a solo career. Castro made good on his word, refusing to grant Cruz permission to attend her mother’s funeral in Cuba in 1962. Cruz” initial fan base in the United States was confined to the Cuban exile communities, including those in Florida and New Jersey, where she and Knight settled. In 1966, she joined forces with Tito Puente, a Puerto Rican percussionist and bandleader who had achieved an international following. As a vocalist for Puente’s band, Cruz became identified with the emerging salsa genre, mixing elements of Caribbean and African styles in a highly danceable mélange. Her association with Puente would result in eight albums for the Tico Records label, including 1966’s Cuba Y Puerto Rico Son, and additional recordings for Vaya Records. Cruz also developed a musical and stage persona during this period that would endear her to legions of fans for whom she would become “La Reina de la Salsa” (“queen of salsa”). Along with a strong husky voice that meshed with a driving salsa rhythm section, she danced flamboyantly, told entertaining stories, and engaged audiences with tireless passion. She also sported outlandish custom-made costumes featuring sequins and feathers and notoriously high-heeled shoes. During the 1970s, a new generation of Latin Americans became fans of salsa music, and Cruz’s fame spread along with her achievements. She performed with greats such as pianist Larry Harlow and headlined a concert at Carnegie Hall, where she returned in 1973 in a staging of Hommy—A Latin Opera, the Spanish-language adaptation of The Who’s famous rock opera Tommy. In 1974, while signed with the leading salsa record label Fania, Cruz recorded the album Celia and Willie with trombonist Willie Colon. She was one of the Fania All-Stars, drawn from the label’s artists, performing with them regularly, including during a 1976 Yankee Stadium concert in New York. She was also a regular at the annual salsa festival held at New York’s Madison Square Garden. In addition to her base in the New York region, she played often in Miami, and was much adored by the Cuban exile community there, for whom she symbolized both the sadness of their abandoned homeland and the promise of their new lives in America. While Cruz always sang and recorded in Spanish, she collaborated with a number of leading artists from a variety of genres, including the great R&B vocalist Patti LaBelle, opera tenor Luciano Pavarotti, and Wyclef Jean. She also made several feature film appearances, including 1992’s The Mambo Kings and The Perez Family in 1995. Her recordings continued to be popular and garnered recognition in the form of Grammy Awards in 1990 for Best Tropical Latin Performance for Ritmo en el Corazon and Best Salsa Album for La Negra Tiene Tumbao in 2003. She also won Latin Grammy Awards in 2000, 2001, and 2002. President Bill Clinton awarded Cruz the National Medal of Arts in 1994. Cruz vowed never to retire, and she continued to record even after she was afflicted with the brain tumor that would lead to her death in 2003 at her New Jersey home. Her final album, released that year, was entitled Regalo de Alma (“gift from the soul”) and won the Grammy for Best Salsa/Merengue Album that year and a Latin Grammy for Best Salsa Album posthumously in 2004, a fitting legacy for one of Afro- Cuban music’s most soulful singers. Hundreds of thousands of admirers turned out for memorials in Miami and New York, where she was buried at Woodlawn Cemetery.